Today I did not have too much time to work on this piece as I was out on a consult with a client for part of the day. 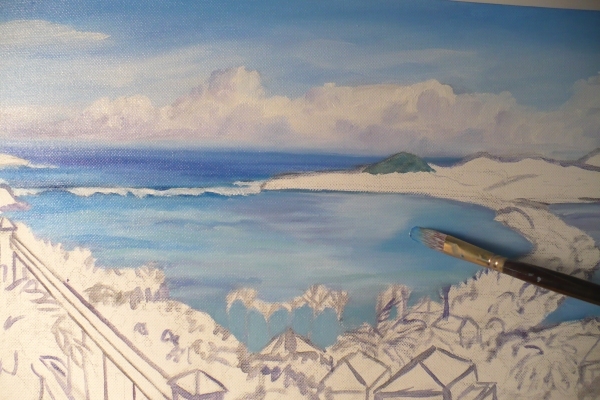 But at least there was time to paint the ocean. You can see that the horizon is softened to almost blend with the clouds. This pushes the horizon line visually back to give the feeling of far distance. The deep water past the coral reefs is a deep cool blue. As it comes toward shore, it becomes a lighter, turquoise blue. Below is the full piece with the water done for now. Perhaps I will adjust the colors and values as needed once the landforms are painted. Tomorrow, though I have to teach a class, there will be time to work on the distant landforms. 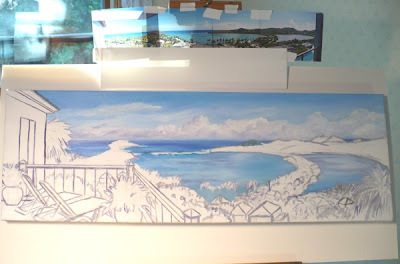 Hope you can stop by to see the next part of this seascape oil painting demonstration - Coming Ashore! Oh, I love watching you paint water. I can't wait to see the finished work!